You millennials! You’re so entitled, and fragile, and bad with money, and… yeah, no. All the millennial stereotypes are total myths. You work hard, you’re tough, and you’re financially savvy. When it comes to car insurance, however, you might be paying too much. That’s because auto insurance rates depend heavily on age. Car insurers charge drivers under 25 a lot more. It’s not just that they have a higher risk of claims; younger drivers also have a shorter credit history (or not-so-great credit); they’re more likely to cancel their policy; and they often live in cities. As you get older, you should become eligible for lower car insurance rates. 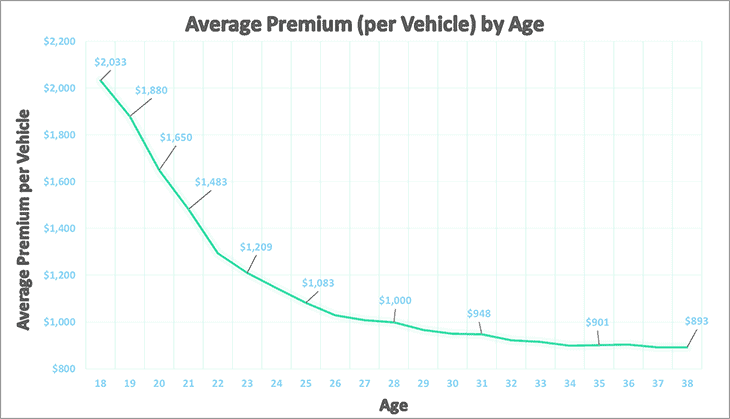 Below, we have graphed out the average annual premiums by age for current U.S. drivers. To get the best deal, you’ll have to compare car insurance quotes often (It may make sense to compare every six months, or when your policy is about to renew). But how you do know which company to choose? Which Companies Offer the Best Car Insurance for Millennials? These companies aren’t ranked in any specific order, and some only insure drivers in certain states. Clearcover Insurance cuts the flashy marketing and uses AI so that it can offer really cheap insurance rates. The app lets you file claims by describing what happened and taking photos of the damage — no on-scene adjuster required. 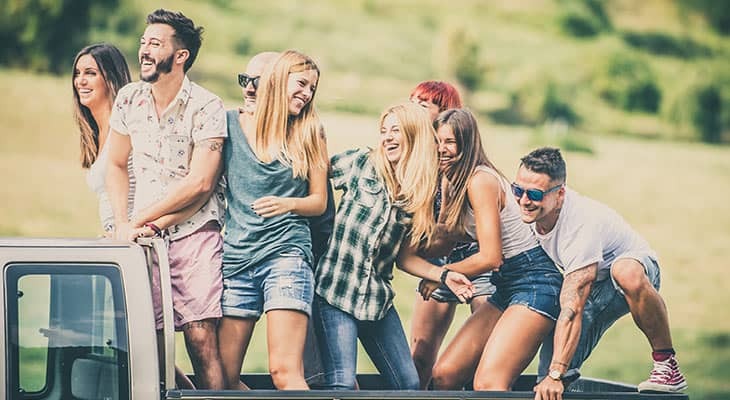 Millennials who have dedicated their lives to public service should check out California Casualty, a respected auto insurer that offers special discounts to people who are firefighters, EMS professionals, nurses, police officers, educators and college employees. Millennials on average pay 26.1% more on car insurance than Baby Boomers with California Casualty. Many millennials wonder why their insurance rates are so high when their driving record is pretty good. The answer may lie in your insurance score, a secret number based on your financial and credit history that insurers use to set premiums. Say Insurance not only reveals your score, but tells you how to improve it. Millennials on average pay 42.2% more on car insurance than Baby Boomers with Say Insurance. Metromile offers some of the best car insurance for millennials who work from home, have a short commute, or prefer walking/biking/scooting to driving. Its low-cost pay-per-mile insurance charges you a base rate ($29 and up) per month, plus a few cents for each mile you drive. Metromile also includes pet injury coverage with collision and comprehensive coverage on all policies (except in IL and VA). Plymouth Rock offers tons of discounts and perks, like its Crashbusters® vans that settle claims quickly and its Door to Door Valet Claim Service®. The company will even pay for your cab ride home (up to $50, once a year) so you don’t risk getting a DUI. Millennials on average pay 43.8% more on car insurance than Baby Boomers with Plymouth Rock Insurance. Amica consistently ranks as one of the best car insurance companies for customer service and satisfaction. Money-savvy millennials love that Amica is a mutual company, which means you receive money back every year (usually 5 to 20 percent of the premium you pay) when you choose a dividend policy. Millennials on average pay 39.5% more on car insurance than Baby Boomers with Amica Mutual. Seven in 10 millennials own a pet. Virtually all of them own a mobile phone. Why not protect them both, along with your car? State Auto’s AutoXtended® Endorsement can protect your pet (in case of an accident in your vehicle) and your phone, as well as covering emergency travel expenses, bail bonds, locksmith/key replacement, emergency ambulance transportation and even disability coverage. Millennials on average pay 39.9% more on car insurance than Baby Boomers with State Auto. Mercury prides itself on offering lots of discounts and low rates across the board, including for young drivers. Mercury also provides low-cost ride-hailing insurance for Uber and Lyft drivers. Millennials on average pay 39.2% more on car insurance than Baby Boomers with Mercury Insurance. Is your credit more dinged-up than an ’98 Honda? You’re not alone. The average credit score of a younger millennial (22-28) is 652. Older millennials (29-35) are barely ahead, averaging 665. In Texas, one of the best insurance companies for young drivers may be Lone Star, because they don’t consider credit at all when calculating premiums. Millennials on average pay 27.9% more on car insurance than Baby Boomers with Lone Star Insurance. Allstate’s mobile app is a winner, putting all the services you need — and a few extras — in your pocket. Get mobile proof of insurance; instantly contact your agent; file a claim and access Allstate’s Drivewise program. The app can also help you find the cheapest gas nearby, or tell you where you parked your car. AI car insurance might be great— until you get into a situation when you really just want a friendly human to help you out. Verti, which offers car insurance in Pennsylvania, promises low rates and a dedicated Personal Advisor you can call, text or email. Verti has a good app, too, with one-tap access to help in an emergency. Millennials on average pay 39.1% more on car insurance than Baby Boomers with Verti Insurance. Maybe, like many other millennials, you’ve had a run of bad luck — multiple traffic violations, an accident or two, an insurance lapse or a few unpaid bills. The General will work with you when other insurance companies won’t, offering low down payments and flexible billing schedules. Millennials on average pay 25.6% more on car insurance than Baby Boomers with The General. This highly rated insurance company (its parent is Liberty Mutual) has a ton of options designed to fit millennials’ lives. Safe driver? You can save up to 30 percent with the RightTrack telematics program. Pet owner? Add pet coverage. Part-time Uber or Lyft driver? Safeco offers low-cost RideSharing Coverage to protect you in those gaps between picking up passengers. Millennials on average pay 43.6% more on car insurance than Baby Boomers with Safeco. Root’s app does it all: tracks your driving habits, gives you a quote, and lets you file claims and call roadside assistance. Because the company only insures safe drivers, its rates can be super low. Root Insurance says many of its customers save 52 percent (or more) off their old insurance rate; the average annual savings is $1,187. SafeAuto specializes in insurance for high-risk drivers. Their free app not only lets you access your policy and proof of insurance but also helps you manage your cash flow: one tap and your bill is paid. Millennials on average pay 30.5% more on car insurance than Baby Boomers with SafeAuto. A late payment or insurance lapse can cost you dearly. That’s why Kemper, which offers affordable car insurance for high-risk drivers, will send you a text alert if your policy’s ever in danger of being canceled. Pay in seconds from your smartphone. Millennials on average pay 36.5% more on car insurance than Baby Boomers with Kemper Auto. Infinity makes it super easy to get the service you need with its free app, live chat and bilingual service options. You can join its DriverClub® roadside assistance program for free, even if you don’t have an Infinity insurance policy. Millennials on average pay 27.5% more on car insurance than Baby Boomers with Infinity. Good2Go offers cheap insurance for young drivers and those who have a spotty driving record. Specializing in state-minimum insurance with low down payments, Good2Go also gives customers a cell phone safety discount for using the LifeSaver distracted-driving app. Millennials on average pay 28.2% more on car insurance than Baby Boomers with Good2Go. Smart millennials manage their money by putting everything on auto-pay. Encompass will give you a discount for doing just that: You get one discount for using its Easy Pay® system and a Good Payer discount for paying your bills on time. Millennials on average pay 40% more on car insurance than Baby Boomers with Encompass. Born in 2003, Empower Insurance is a Gen Z company — but it offers great car insurance for millennials who have bad credit, because many of its insurance offerings don’t consider credit when calculating premiums. Millennials on average pay 35.4% more on car insurance than Baby Boomers with Empower. Elephant is one of the best car insurance companies for budget-conscious young drivers, offering discounts to save you up to 40 percent: discounts for going paperless, being a good driver, paying your policy in full, etc. Millennials on average pay 47.2% more on car insurance than Baby Boomers with Elephant Insurance. Back in 1999, Esurance was one of the very first companies to introduce the idea of getting insurance quotes and buying a policy online. It continues to innovate, with a powerful app that makes it easy to show mobile proof of insurance, file claims and manage your policy. Millennials on average pay 31.5% more on car insurance than Baby Boomers with Esurance. Offering nonstandard auto insurance, Direct meets millennials where they are. Pay by text, pay with cash or set up a personalized payment schedule. Millennials on average pay 25.6% more on car insurance than Baby Boomers with Direct General. Not only does Dillo have the cutest insurance mascot (sorry, gecko), this Texas car insurance company caters to millennials with low-cost insurance and speedy online service for higher-risk and new drivers. They don’t check credit, either! Millennials on average pay 35% more on car insurance than Baby Boomers with Dillo. This California auto insurance company has a versatile app with secure fingerprint or face verification, mobile proof of insurance, mobile payments and roadside assistance. Millennials on average pay 42.8% more on car insurance than Baby Boomers with 21st Century. Find your perfect auto insurance fit. It only takes a few minutes to compare car insurance quotes and see how much you can save. Start comparing!